Simple.tv is selling a DVR that is geared towards cord cutters, allowing them to record free over-the-air HD TV and stream these recordings to mobile and connected devices. Simple.tv CEO Mark Ely has been talking about adding cloud DVR functionality to its product for some time, in part to make it easier for people to stream videos on the go without having to rely on the upload speeds of their home internet connection. At the sidelines of CES, he showed me a demo that was streaming TV show episodes straight from Amazon’s (S AMZN) S3 cloud storage service. The demo also made use of a new HTML user interface that integrates TV guide data from Gracenote and offers users a way to find any TV show episode that they may have missed to record on Netflix, (S NFLX) Hulu and other streaming services. Simple.tv’s new web UI, which is currently in development. Notice how some of the shows have a small cloud icon, indicating that copies are stored on the cloud DVR. Ely said that Simple.tv hasn’t determined the exact price of the offering, or the amount of storage offered to consumers. He told me that there are no plans to offer unlimited storage, as Boxee did with its since-defunct cloud DVR, but that it will likely also work with first-generation Simple.tv devices. Simple.tv recently launched completely revamped hardware, which is being manufactured by Silicondust, and offers consumers two tuners for $250. Silicondust is pretty well known amongst cord cutting enthusiasts for its networked TV tuners, which it is selling in countries around the world. The company’s CEO Ted Head said that he plans to sell Simple.tv in every single market in which SiliconDust currently sells its products, and that it will help him to reach new customers who weren’t as technical as SiliconDust’s core audience. “Marrying up with SImple.tv is perfect,” he said. First up on the list of expansions could be the U.K. Ely told me that the two companies could launch a version that can handle Europe’s different broadcast standards in that country as early as April. 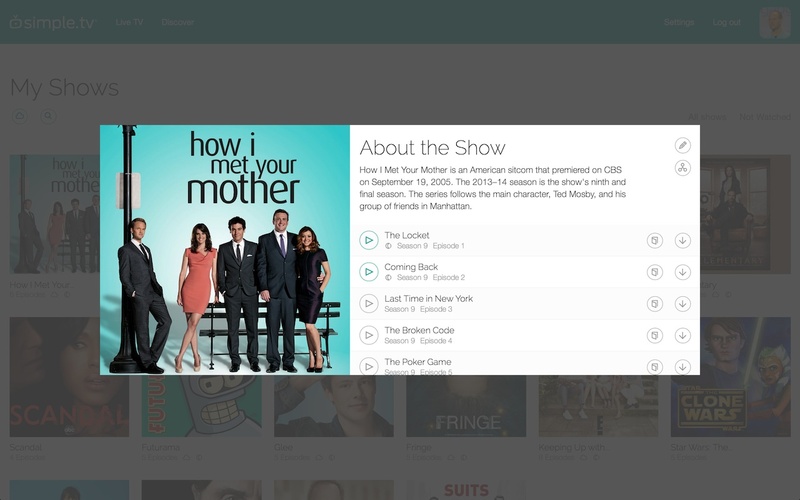 The next version of Simple.tv’s web UI will suggest alternative sources for streaming if an episode of a show didn’t get recorded. I totally agree with @mayorwatch. In UK, they can be bought on the high street for less than Â£100 and give access to more than 70 TV channels. This is possible because, they use cloud based technologies just like this site http://www.usanswer.com/. The UK is awash with non-subscription PVRs – they can be bought on the high street for less than Â£100 and give access to more than 70 TV channels via the aerial, including 10 free HD channels from three of the largest broadcasters in the country. All of which is a very long way of saying that Simple.tv will find there is no market for it here where ‘cord cutting’ simply isn’t an issue and 40% of homes access one of the three non-subscription services – Freeview, Freesat and YouView – rather than pay TV. I’m still waiting for my simple tv 2 device to arrive. Looks like everyone else is waiting also. I did try the Aereo service on their 30 day trial. My experience with Aereo was the quality of their streaming service. The picture quality was not that great. There was a lot of pixilation in the live content as well as the recorded content. Whether viewing it on the ROKU 3 or streaming it from my iPad to the TV it didn’t seem to make much difference. Aereo records in three different modes so depending on your internet connection it can choose the correct mode. It didn’t mater which mode I choose though, as they all were less than stellar quality. The service itself was quite easy to use. The iPad application was easier and more user friendly than using the ROKU application. I’m hoping that when the simple tv device arrives and I can finally use it, that the picture quality is much better than Aereo. Hopefully not being in the cloud is what will make the quality difference. I hear you on the picture quality issue. Just because it comes through at 1280×720 or 1920×1080 doesn’t mean it’s actually high def. Compression can be a killer. Personally I prefer for there to be more of a buffer to start than to have instant video of lesser quality due the variable bit rate streaming. I’m afraid our society doesn’t really seem to care anymore though, so I’m sure I’m on the losing end of that battle. No video streaming service hosted by Amazon is going to be able to scale. Bandwidth charges are too high. 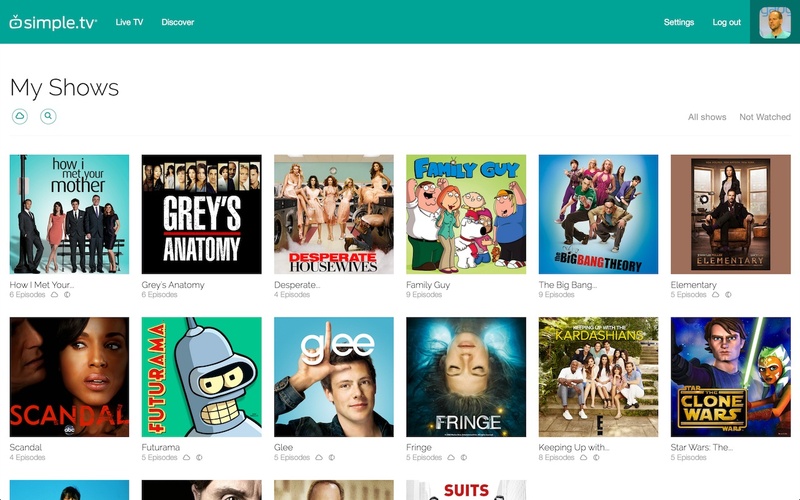 Doesn’t Aereo blow Simple.tv out of the water? Aereo is still in limited deployment, so there is plenty of room for both of these products to coexist, at least for now. How much does Aereo cost? Our basic monthly membership is just $8 a month, plus tax. That gets you 20 hours of DVR space to record your shows. Or, for $4 more, you can upgrade to 60 hours of DVR space and the ability to record two shows at once. So Aereo seems to max-out at 60 hours of DVR space and costs 12/Month for 2-tuner capability. Simple.TV is $250 for the 2-tuner + cost of hard drive, and $50/yr for “premium service” (which you realistically always need) or $400 for 2-tuner with lifetime premium service. However, you can pre-order the 2-tuner for $200 and I bought a lifetime gen 1 from Woot for $90 (lifetime good for all tuners on account) plus a $90 2TB WD AV drive for a grand total of $380. That’s approx a 3 year break even with Aereo, but with no ongoing $120/yr service cost and vastly greater recording space (and 3-tuners if I re-purpose a second hard drive for the gen 1 unit) – and the Roku (and future Chromecast) apps make integrating the solution to the big screen very nice. Of course, I’m responsible if the hardware breaks, but my experience with SiliconDust products has been very good (for the gen 2 hardware at least). Your analysis is correct, however, it doesn’t account for the possibility that Simple.TV might not exist tomorrow, much less 3 years from now. Look at how Boxee just ceased to exist. The investment in hardware might not be the best decision for everyone in this brave new world! That said, I am awaiting my pre-order for the gen 2 Simple.TV unit and really want to see how it performs. I don’t have Aereo available here (yet). Very true…as a current SageTV user, I fully understand that scenario. I was bolstered a bit by their alliance with Silicondust and Simple.TV’s recently announced plans for a European roll-out & PAL support this year, but being an early adopter is not without its risks. But like you, I don’t have Aereo as an option yet (and am not really sold on clould dvr for my needs) and am anxiously awaiting my gen 2 pre-order. BTW, Amazon now has the Simple.TV 2 for $199.99 pre-order with Prime shipping (it was at full price until recently). I canceled my NewEgg pre-order and switched it to Amazon since I have Prime and they seem to get orders processed a bit quicker than NewEgg – for when/if it is ever released. Or you can do what I’ve done, order a Simple.TV with lifetime premium for $90 off of Woot +$5 shipping and attach an old external HD you already had lying around gathering dust, in my case a 111GB WD which I haven’t used in more than a year. True, I’ve only got one tuner, but for $95 I have 54GB of storage versus 20GB on Aereo for $96 (which isn’t yet available in my market, even though is was on the January 2013 list for introduction last year (Simple.TV isn’t the only company in this field which over promises on delivery dates.) If Simple.TV survives more than a year, I’m money ahead. If they survive long term, I now have my lifetime premium, which can be used for upgraded Simple.TV boxes. And, while Aereo is legally limited to the DMA in which it operates, Simple.TV can legally provide a whole planet live TV/DVR solution. While there is a great deal of overlap between what these two products offer, there are also significant differences. Aereo is better for some (especially those who don’t want to work with the gadgets and those who live in a DMA with a lot of OTA, but which they have trouble receiving due to buildings or topography), while Simple.TV (and Tablo) is better for others (those without Aereo in their market or with good reception and a desire to record and store a lot or to use outside the DMA). And if you have no need or desire to watch your recordings on more than one TV and good reception, a Channel Master DVR+ might be the way to go, especially if could pick it up at a discount ($250 seem a little steep for what it does). This is really an area in which one size doesn’t fit all. I tried Aereo. The picture quality was lousy. They are massively over-compressing the signal, leading to very visible macro-blocking and other artifacts. It is unwatchable on my 67″ 1080p set. If they ever improve their picture quality, I would be interested in trying it again though. Yeah, the picture quality on Aereo is not anything that could realistically be called HD. The simplicity of it is very appealing however. You journalists need to challenge Simple.tv against their claim (which has been repeated several times over the past couple of weeks) that “Simple.tv recently launched completely revamped hardware”. They haven’t released any new hardware to anyone yet – Newegg and Amazon have it on pre-order, and Newegg’s ship date just keeps moving further out everytime it comes due…with the current date set as Jan. 17th. I’ve got the gen 1 Simple.tv and it is actually a pretty good device, but fixes come way to slowly and they seem incapable of getting their gen 2 hardware and software out the door, despite their claims to the contrary. Actually these journalists need to check their facts. I, too, am tired of hearing that Simple TV launched version 2.0 when my preorder from November is still in preorder status. I want to wait for Simple to get things together, but Tablo is looking better and better every day.